In conjunction with specific diet. Information taken from “Home Treatment for Arthritis” by Charles de Coti-Marsh. The guide was written in 1966 for the Arthritic Association, which he founded in 1942. 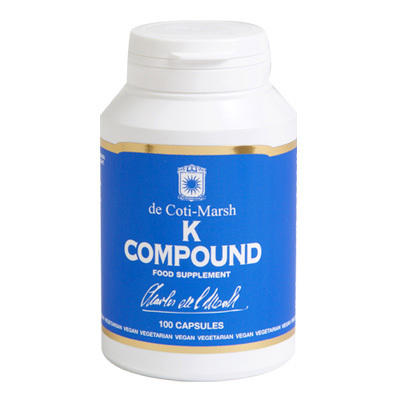 Charles de Coti-Marsh both formulated and promoted the K-Compound as an essential part of the diet he proposed for arthritis sufferers. He believed extra Potassium is needed by every person who has a tendency to rheumatic or arthritic disorders. Both the energy-producing diet (rich in potassium) and the treatment, in the form of the supplements he formulated and recommended all those years ago are still used by many sufferers of arthritis today. The principles he established were validated by the Centre for Human Research, Elsie Widdowson Laboratory (a division of the Medical Research Council), Cambridge. The report endorsed the fundamental principle that a wholefood, vegetable, grains, fruits and nuts, together with a low fat, sugar and sodium diet is necessary for preventing and treating arthritis. That Charles de Coti-Marsh established a diet that could be scientifically authenticated so many years later is testament to his lasting legacy. Today Bio-Health Ltd continue to manufacture and supply the Charles de Coti-Marsh’s successful range products for arthritis, including K-Compound, under the Hursdrex trade mark. Energy Plus – Vegetarian Capsule – to provide essential nutrients and trace elements. Deep Seaweed – Vegetarian Capsule – to provide essential minerals and trace elements. Decalcine – Vegetarian Capsule – to support a potassium rich diet. Note: The information given is taken from original work done by Charles de Coti-Marsh and Hursdrex Ltd.
K-Compound is manufactured by Bio-Health Ltd in Rochester, Kent.